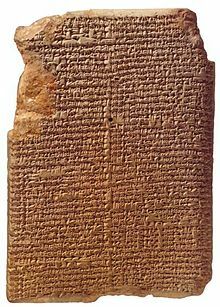 MUL.APIN, the most famous Babylonian series of astronomical tablets, preserved in a copy from the 7th century BC (although it was compiled in roughly 1000 BC). It is part of the British Museum collection (BM 86378), although it is not on display. Credit: Wikimedia Commons. Astronomy is one of the oldest natural sciences in the history of mankind (depending on one’s definition of „science“, of course). The first civilisation that observed the sky systematically are the Babylonians. They have left us innumerable clay tablets with astronomical records. The clay tablets known as „Astronomical diaries“ contain various kinds of information aside from astronomical observations (for example political events, the price of various important goods or the level of the river Euphrates). The astronomical records contain day by day information about the positions of planets, the Sun and the Moon, rare astronomical events like eclipses, and so on. Sometimes we find the remark „I did not watch“, which means that there were clouds in the sky, making observation impossible. This is particularly troublesome for the Babylonian lunar calendar, because it depended on the first visibility of the crescent moon after New Moon. If the crescent moon was visible on the 30th day, the previous day was the last day of the previous month and the 30th day was the first day of the new month. If the crescent moon wasn’t visible on the 30th day, the month automatically ended and the new month started on the 31st day. There is also a substantial amount of Omen tablets, which derive predictions for the future from astronomical observations. Omina could, by Babylonian thinking, be averted – one extreme case is a prediction that the king would die. The Babylonians appointed a substitute king (a slave or prisoner) for the duration of the omen (60 days). If by the end of that period, the substitute king hasn’t died, he was killed and the „real“ king was reappointed. That way, the omen was fulfilled. The zodiac is also attributed to the Babylonians. They invented it as a measuring device for planetary positions, but the zodiac in its current form is only evidenced from the 7th century BC onwards. They devided the ecliptic into 12 parts of 30 degrees each, but also used a second system of bright stars in the 3 „paths of Enlil, Anu and Ea“ running parallel to the celestial equator. The Greeks weren’t good observers (or at least not that we know of) – but they were good philosophers and poets. Hesiod and Homer referred in their writings to the constellations of Boötes, Orion and Ursa Major, they mention the star clusters Pleiades and Hyades and the stars Sirius and Arcturus. Aratos of Soloi wrote a poem called „Phainomena“, which lists all the known constellations of ancient Greece, Eratosthenes wrote a treatise called „Katasterismois“ („placing among the stars“), which explains the mythological origins of constellations. Klaudios Ptolemaios – famously – is the author of a star catalogue (contained in the Almagest), although we know nowadays he was using an earlier catalogue, compiled by Hipparchos of Soloi. Astronomy was part of mathematics in ancient Greece, so it comes as no surprise that the philosophers were thinking about the nature of the universe and how to measure the solar system, but they also tried to assign a geometrical model to the motion of the celestial objects. There were two rivalling systems in the Greek world – the heliocentric and the geocentric model. The first person to propose a heliocentric model was Aristarchos of Samos (ca. 300BC), although his own writings are lost and we only know about this from contemporary writers and critics. The name of a second philosopher, who supported this model, is handed down to us – Seleukos of Seleukia (ca. 200BC), although there were potentially more, since Plutarch tells us about „followers of Aristarchos“. Annotazione on Sacrobosco’s Tractatus de Sphaera (dating to 1550), showing the Ptolemaic system. Credit: Wikimedia Commons. Influental philosophers like Plato and his student Aristotle preferred the geocentric model. Plato places the Earth as a sphere (!!!) into the centre of the universe. The stars, planets, Sun and Moon were affixed to concentric sphere – the number differs from author to author – which rotate around the Earth. 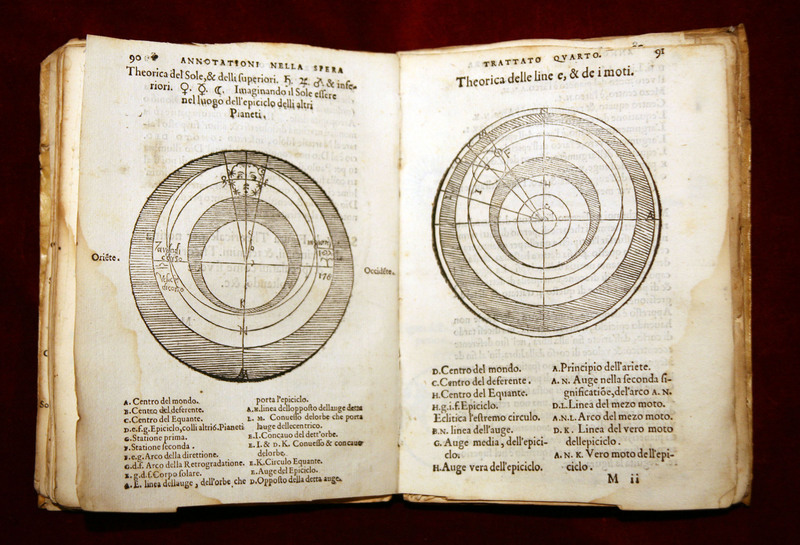 The aforementioned Klaudios Ptolemaios created a mathematical model for the geocentric system in his book that is nowadays known as the „Almagest“. Each planet’s movement is explained by two spheres – the deferent and the epicycle. The whole system is complicated, because the centre point of the deferent is removed from the Earth to account for the different lengths of the seasons and the apparent movement of the outer planets when observed from Earth (planet slows down, stops, then moves in retrograde motion backward in the sky, only to slow down again, stop and then continue in the normal prograde motion). It will take more than 1500 years for somebody else to come up with a system that is much simpler and easier to handle, but more about this later in part II of the post! The Romans weren’t very original when it came down to astronomy. Cato and Varro used astronomy in their agricultural works (for example the heliacal rising of Pleiades in spring to indicate the beginning of the farming season). After the Roman conquered the Greek the „scientific centre“ in Alexandria, they incorporated Greek knowledge into their philosophy and school system, but didn’t really add more knowledge after that. Aratos of Soloi’s poem „Phainomena“ was translated by three Romans in three different times (Marcus Tullius Cicero, Germanicus Caesar and Rufus Festus Avienius). 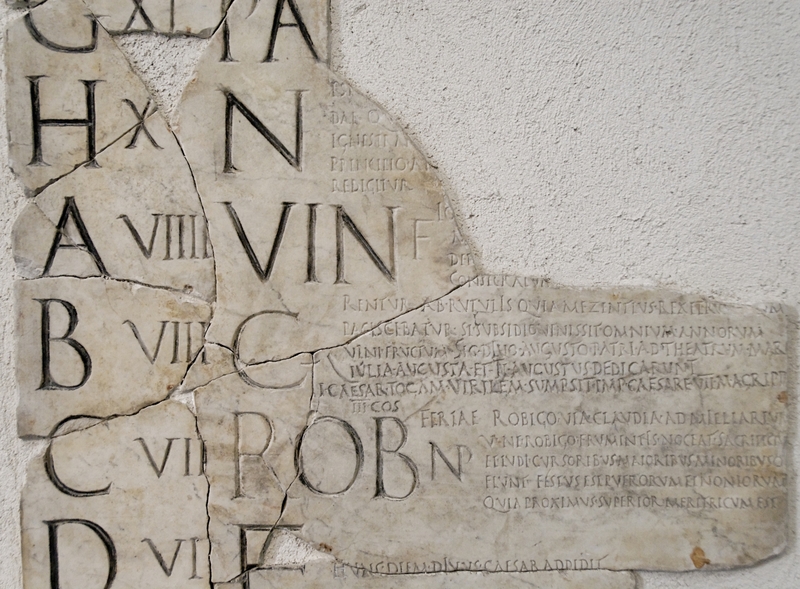 Fragment of the Fasti Praenestini, named after a town Praeneste just east of Rome, where the calendar was set up in marble on the forum. It was probably dedicated to Emperor Augustus. This fragment shows the month of April. Credit: Wikimedia Commons. One thing the Romans – or more specifically one Roman – will always be famous for is the Julian calendar reform. It took effect shortly after the Romans conquered Egypt in 45BC. The Roman calendar had an irregular intercalation system and therefore the seasons were moving through the year. Julius Caesar employed the help of an Egyptian astronomer to counter that problem. The lengths of the months were changed considerably (for example two days each were added to January, August and December) to add up to 365 days in an ordinary year. The intercalary month was abolished, instead an ante diem bis sextum Kalendar Martias („the sixth doubled before the Kalends of March“) was added. There is much debate about where exactly this extra day was added in leap years, as apparently there was no specific rule. Also, there apparently was confusing about when to add the extra day, so for a while, the Roman pontifices added it every three years (instead of four) – though August ordered for this to be put right in 8BC. The Julian calendar (for which Roman poet Ovid wrote the „Fasti“ – unfortunately only the first half of it is extant) was in effect until 1582AD, when Pope Gregory XIII had the calendar reformed again, because there were problems with the calculation of the date of Easter. In the Middle Ages, there was a whole branch of science dedicated to this problem – the Computus. But more about this in part II as well! 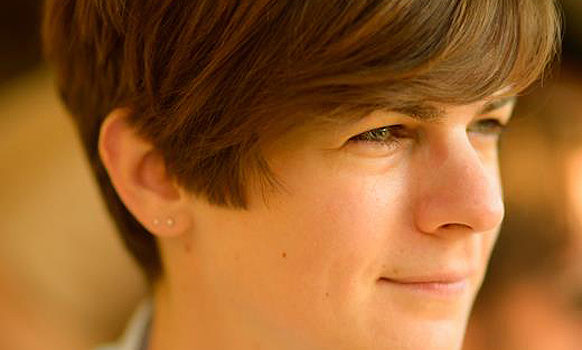 Doris Vickers, born in 1980 in Vienna, is a classical philologist and science historian. While studying ancient languages, she found out that she could combine her two main interests – astronomy and ancient cultures. She’s currently working on a Roman text from the 4th century AD, dealing with astronomical portents. She’s working as the content manager for the Portal to the Heritage of Astronomy, scientific coordinator for the Ancient Skies project and is a member of the Society for the History of Astronomy and a Fellow of the Royal Astronomical Society.